MapMyPage is an awesome utility that enables bloggers and web site owners to attract and engage their visitors by adding maps, photos, weather, and more to the locations mentioned in their web pages. What's even better is that to do this you only have to add a tiny piece of code to the html of a page. If you add that tiny piece of code to the code of a web page every time a location is mentioned on that page a small globe will appear next to the location. When visitors click on that globe a Google Map of the location will appear hovering above the page. Google Maps Mania originally reviewed MapMyPage back in September but since then they have added a number of new features. One of the new features is the integration of the Google Earth Browser plug-in. So now it is possible for your readers to also click through on a location mentioned on your page and view the 3D buildings and terrain that come with Google Earth. 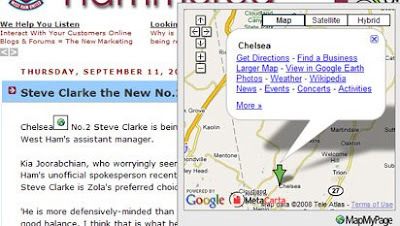 MapMyView have also added Street View, Traffic, Terrain, Local Search, Panoramio photos, and Wikipedia articles to the maps. i don't think using an example that is several thousand miles out in it's accuracy is a good idea! That map doesn't how the London area that the article about the football team refers to. Well spotted Steve. I can't believe I didn't notice this when I took the screenshot. In fairness to MapMyPage this sort of error is common still with most geocoders and will be due to what ever geocoding provider MapMyPage is using.